Healthy restaurants are officially a trend. Here’s where to find the best of whatever is apparently better for you than pork belly. This review has been a long time coming. Not because we couldn’t decide how we felt about Egg Shop. But because we couldn’t get a table. We had a feeling this might be the case when we walked down Elizabeth Street a few months ago around noon on a Saturday, and passed by a girl we hadn’t seen since sorority rush anxiously searching for Egg Shop. “Wait, where is Egg Shop?” An apathetic boyfriend shrugged. A block down, we were quoted a wait: 90 minutes. We tried again a week later, just before noon on a Sunday. An hour wait. 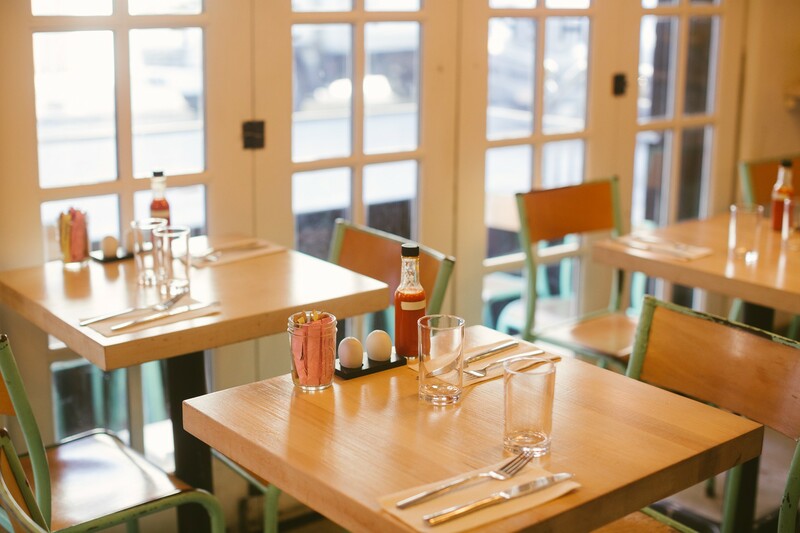 Egg Shop has all the elements of a popular weekend brunch venue: a Nolita location, a brightly-appointed space, and a menu largely centered around oozing yolks, avocado, bacon, and bloody marys. It also happens to be quite small, which contributes to the long lines. We don’t know how long you’re willing to wait in line for brunch, but we do know that Egg Shop is actually open until 1am on weekends. A fancy bacon, egg, and cheese. There’s a runny yolk, chunks of cheddar, some thick bacon, pickled jalapeno, and tomato jam, all on a squishy bun. We enjoyed it, but expect a fancy sandwich - this is not what you get at the bodega. Egg Shop knows what the people want. The people want smashed avocado on whole grain bread. With an egg on top. Instagram gold. (And perfectly enjoyable, if not terribly exciting). Playing the role of The Beast in this Off Broadway production of Brunch is this pulled pork sandwich that comes with a sunny side up egg and pickled onions. Like most everything else we tried, it tasted good. After ordering a sandwich called The Beast, we felt it necessary to order a quinoa bowl called The Spandex. For the bread- and oil-averse, this is a good option. It comes with a poached egg, carrots, and avocado. Bluestone Lane is all over Manhattan now, and that’s a good thing. But for a full-on meal, we still like the original spot in West Village best.